New York: Oxford University Press, 1951. First Edition. Hardcover. Very Good. Signed. Signed. First edition, first printing, first state with dull, matte finish paper covered boards, dated 1951; one of roughly 100 copies in the first state, which were sent to reviewers. 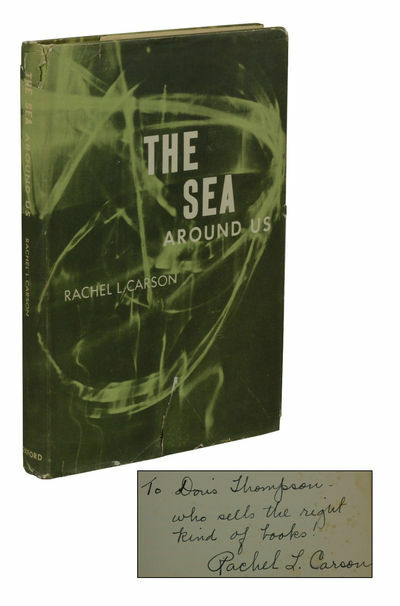 Signed by Rachel L. Carson on the title page, inscribed to previous owner, "To Doris Thompson - Who sells the right kind of books! Rachel L. Carson." Title page is also heavily foxed, with a small smudge to Carson's signature. Very Good, with rubbing at edges. In a Good, later state dust jacket, which is price clipped on the bottom corner of the front flap, with two bars at the top of the front flap and two reviews at the bottom.The jacket is a bit tattered, shows chips to the head and a large tear and associated creasing to the bottom edges of the front and rear panels. Scarce signed and in the first state binding. Housed in a custom folding case.